The Department of Pathology offers a variety of Fellowship positions to individuals with MD, PhD, DVM, and equivalent degrees (Post-Doctoral Fellowships). Click here for a full list of the Fellowship Training Programs. Directory of Pathology Training Programs (published annually by the Intersociety Committee on Pathology Information). All faculty listed in the directory welcome inquiries about their research program and training opportunities. Individual fellowships provide the opportunity for those with a doctoral degree to gain one or more years of in-depth experience in a specific research area. These should be arranged on an ad hoc basis with a faculty member whose research activities are given in this brochure. On a case-by-case basis it is also possible to enter a research fellowship with a faculty member in another department in the School of Medicine. Pathology residents at Johns Hopkins are encouraged to participate in research while in training. However, to achieve significant expertise in a research field, especially at the level needed for an academic career, a period of intensive, specialized experience is highly desirable. Fellowship programs are most often the optimal way to do this. A fellowship is also an excellent way to obtain in-depth exposure to subspecialty diagnostic pathology. 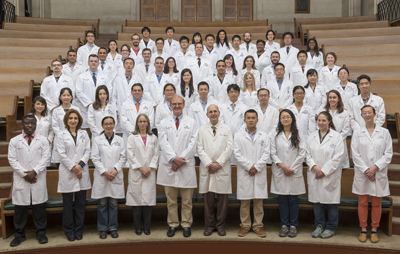 Fellowship opportunities in pathology that meet both research and subspecialty training objectives are available in a variety of settings at Johns Hopkins.